Michi, she is a Japanese painter who is fascinated by the espirit of the Master Kukai traditional calligraphy. 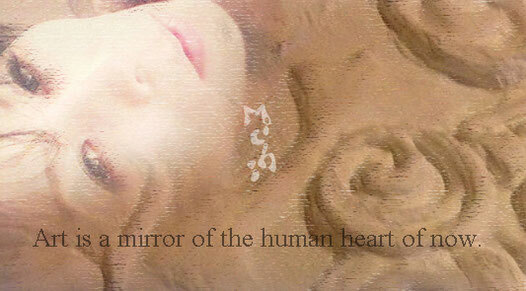 Art is a mirror of the human heart of now. It is not necessary to know how an artist sees own works, I think. Instead, explore your own feelings after seeing an artwork. Art is a means of deep introspection, for human feelings and thoughts are ever-changing. Michi, elle est peintre japonaise qui est fascinée par l'esprit de la calligraphie traditionnelle du Maître Kukai. L’art est un miroir du coeur de l’homme contemporain. Je pense que vous n’avez pas besoin de savoir comment l’artiste voit son art. Vous devriez plutot chercher ces sentiments en vous-meme, apres avoir vu de l’art. parce que les sentiments et les pensées changent constamment. She was born and grew up in Tokyo. Elle est née et à grandie à Tokyo.